I can’t say it . . . without screaming and jumping up and down with glee! 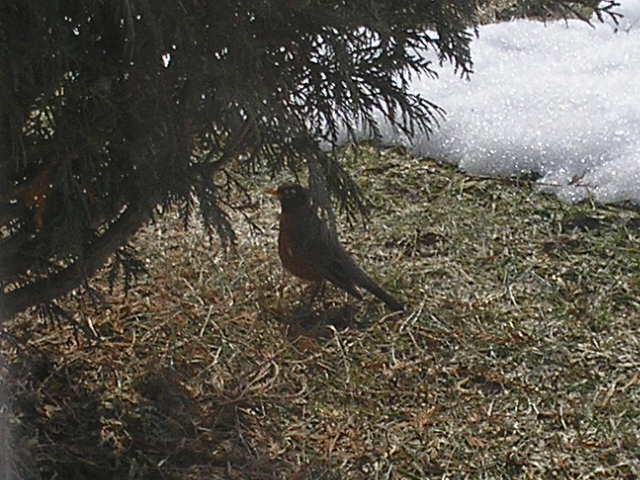 Ribs are recovering … Snow is melting … Easter is approaching … and Robins are arriving! Today, I’m sharing everything Easter; a decor idea or two, how-to’s on one of my Make-Do projects and some great online finds from fellow bloggers. So. . . here we go! Back before the BIG FALL, I purchased an assorted bunch of flowers at WalMart for $7.99. The mixtures are versatile because divided up, they make several smaller bouquets, for more color around the house. This particular bunch had all sorts of odds and ends in it . . . so I really had fun. (Sorry, I didn’t take a picture of the complete bouquet). 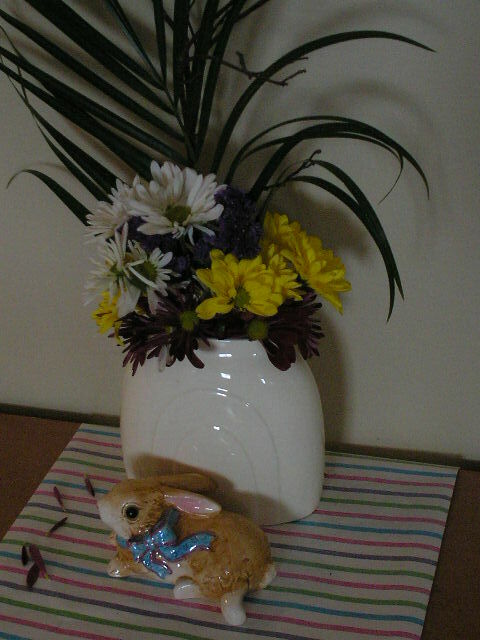 Above, I used the single frond of greenery and added daisies, small mums and purple stasis to a wide mouth vase. 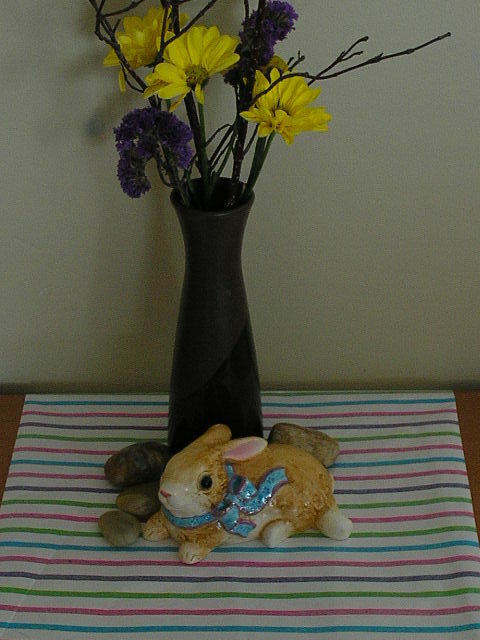 A cute bunny figurine and some pretty paper drape, brightened up my credenza. Below, as flowers faded, the arrangement and vase changed. Included in the bunch, was a single lily branch, with several gorgeous blooms and buds. It was substantial enough to stand alone, needing no other flowers. 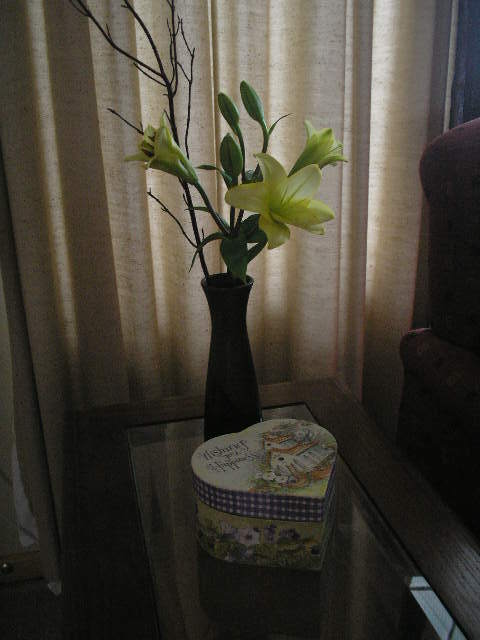 But on an end table, a pretty little box accents the yellows, greens and browns of the stem. I held the remaining blooms from the bouquet and “arranged them in my hand”, then wrapped floral tape around the stems to secure the group. 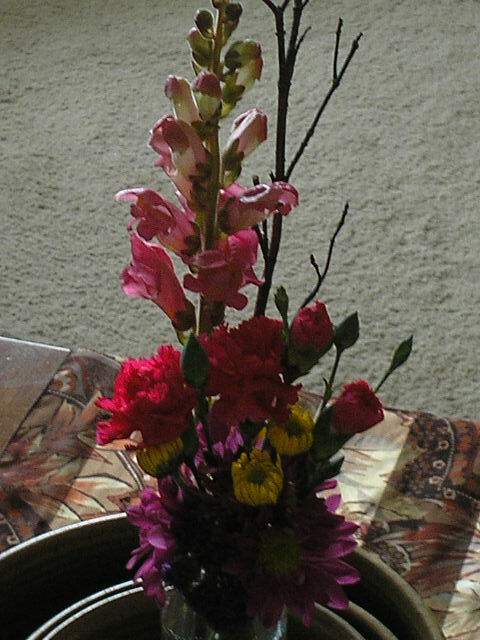 Then I simply trimmed the ends of the stems and placed them in a little vase for a final arrangement. TIP: If you don’t have floral tape, a rubber band or light wire will work. Wire tabs from your bread wrappers work well. TIP: The assorted mix bouquets at store stands range from $2.99 to $14.99, making the prices as versatile as the pretty flowers. Sometimes it’s fun to just get all the same blooms and line them out across a table top, in similar vases. There’s room for immense imagination here! 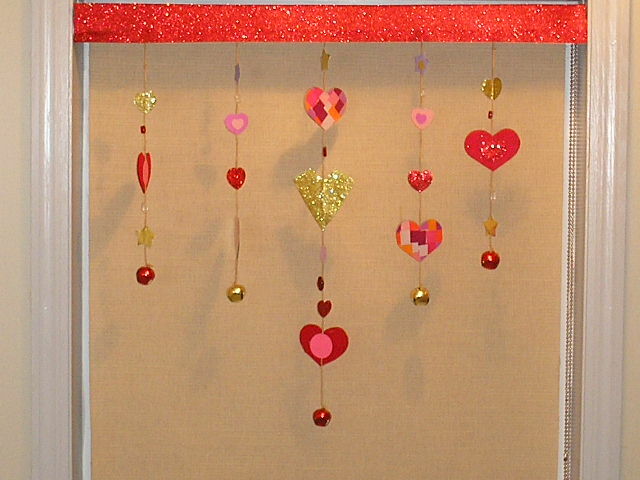 You may remember my “Pretty Gift Box” project, using glue and tissue paper. 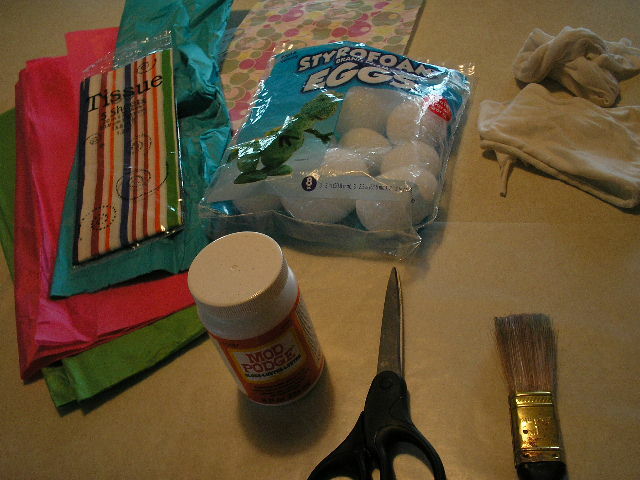 That process is used today, on a package of foam eggs, with some colored tissue and ModPodge. > and two clean rags – one wet, one dry. FIRST I tacked down a good sized piece of wax paper to my work table, to help contain the wet, glue as I worked. The rags were to help keep fingers clean and dry when neccessary. The skewers allow you to hold the egg, making for easier handling as you glue. 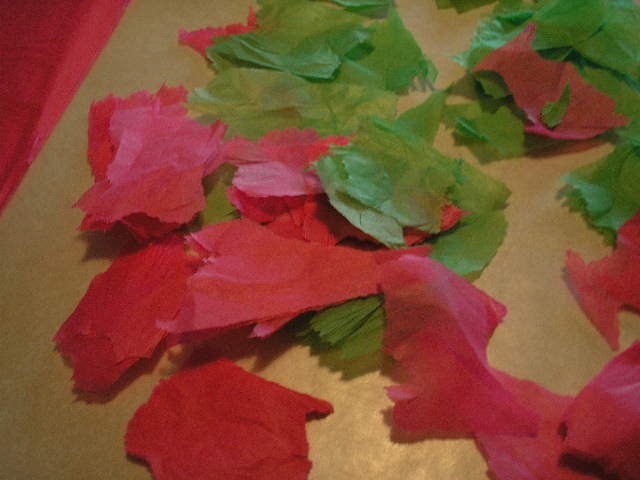 NEXT, tear (just rough rips) small pieces of tissue paper. You don’t want straight, scissors cut lines here. 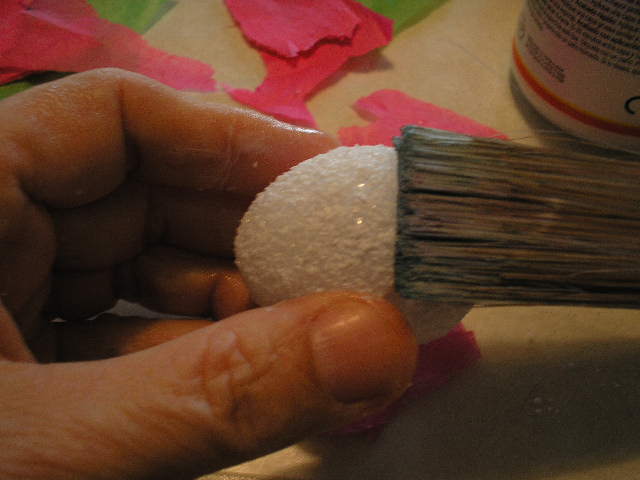 Now, Lightly moisten tip of paintbrush, squeeze out excess water, dip tip of brush in modpodge and begin applying to BOTTOM of egg. 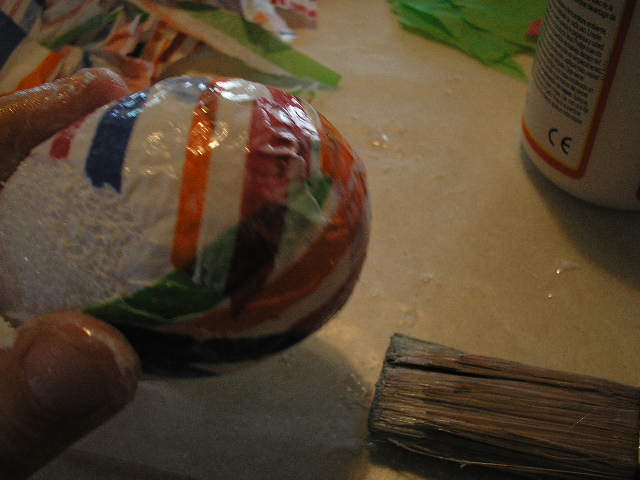 Put a piece or two of paper over the glue, brush flat onto egg. Now push skewer into this area of your egg. The stick gives you something to hang on to and makes the rest much easier to finish. 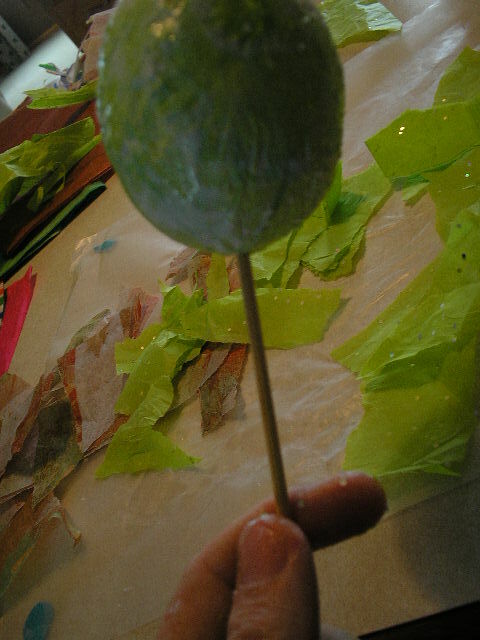 Then just keep going, gluing and smoothing layers of tissue until egg is covered. TIP: Don’t insert the skewer into the bare foam egg before you begin. 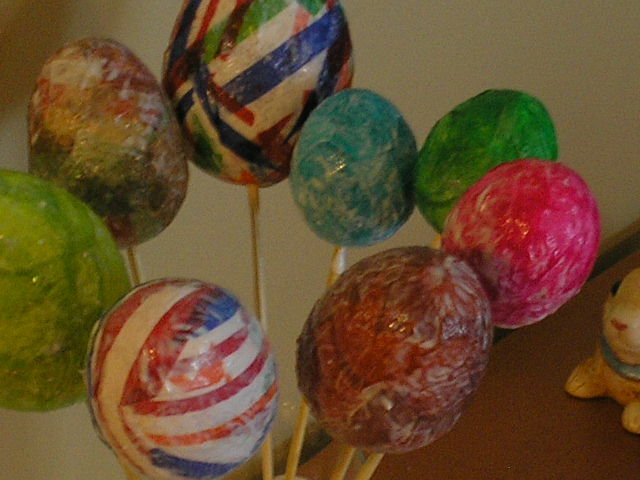 Always put a layer of paper on the bottom of the egg first, then insert the skewer over that. This way the paper won’t stick to the skewer, so you can easily remove it after drying. While your eggs are drying, put them in a tall glass to avoid them sticking to each other. When the eggs are completely dry, carefully pull them off the skewer and use for your project. TIP: If you want to use eggs on a wreath, cut the skewer off about an inch from the bottom of the egg, and you will have something to insert into a foam or branch wreath. Lately, online, there have been tons of pretty projects for Easter. These FREE PRINTABLES from HOW TO NEST FOR LESS are just two. But they’re so colorful AND so appropriate that I just had to share them with you. Thanks Erin. Before I close the post today, I want to express Sincere Thanks to those of you that noted concern and sent well wishes, after my little accident in March. It’s helping me heal faster, knowing that so many others are thinking of me. Much appreciated. And naturally, I LOVE COMMENTS so keep em’ coming! Thanks. 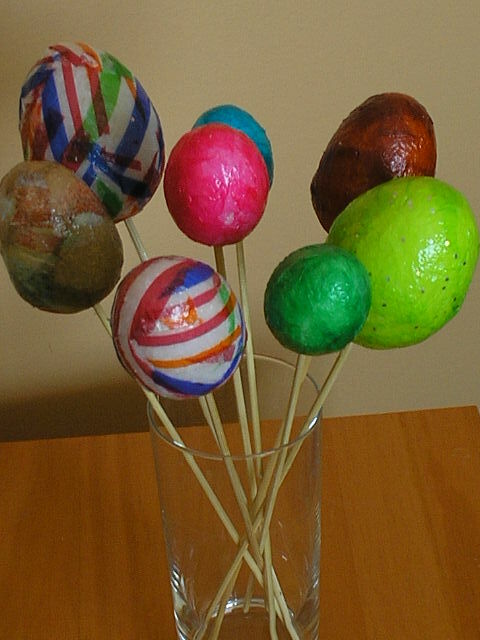 This original article “Rabbits, Robins and Everything Easter” appeared first on Artzzle.com. No included content or photography can be used elsewhere without specific permission and accreditation.